Boost.Asio may be used to perform both synchronous and asynchronous operations on I/O objects such as sockets. Before using Boost.Asio it may be useful to get a conceptual picture of the various parts of Boost.Asio, your program, and how they work together. As an introductory example, let's consider what happens when you perform a connect operation on a socket. We shall start by examining synchronous operations. Your program will have at least one io_service object. The io_service represents your program's link to the operating system's I/O services. 2. 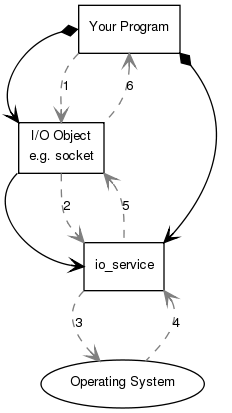 The I/O object forwards the request to the io_service. 3. The io_service calls on the operating system to perform the connect operation. 4. The operating system returns the result of the operation to the io_service. 5. 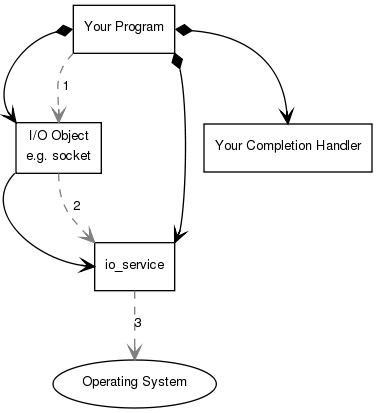 The io_service translates any error resulting from the operation into an object of type boost::system::error_code. An error_code may be compared with specific values, or tested as a boolean (where a false result means that no error occurred). The result is then forwarded back up to the I/O object. then the error_code variable ec would be set to the result of the operation, and no exception would be thrown. When an asynchronous operation is used, a different sequence of events occurs. The exact signature required depends on the asynchronous operation being performed. The reference documentation indicates the appropriate form for each operation. 3. 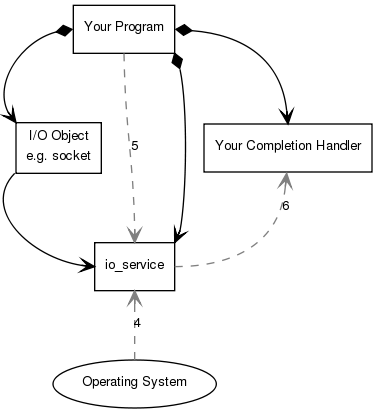 The io_service signals to the operating system that it should start an asynchronous connect. 4. The operating system indicates that the connect operation has completed by placing the result on a queue, ready to be picked up by the io_service. 5. Your program must make a call to io_service::run() (or to one of the similar io_service member functions) in order for the result to be retrieved. A call to io_service::run() blocks while there are unfinished asynchronous operations, so you would typically call it as soon as you have started your first asynchronous operation. 6. While inside the call to io_service::run(), the io_service dequeues the result of the operation, translates it into an error_code, and then passes it to your completion handler. This is a simplified picture of how Boost.Asio operates. You will want to delve further into the documentation if your needs are more advanced, such as extending Boost.Asio to perform other types of asynchronous operations.